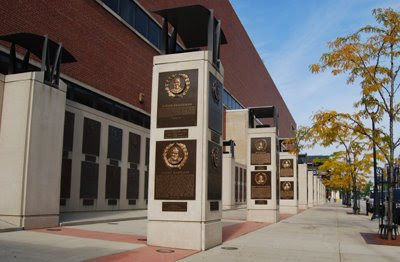 The Wisconsin Athletic Walk of Fame is next to the Milwaukee Arena on 4th Street between Kilbourn and State Streets. The Walk honors the achievements of Wisconsin's premier athletes, as well as those who have contributed to the sporting experience; managers, coaches, announcers, and sponsors. In addition to the obvious, there are some unexpected names among the dozens of names found here.